DoingMiles Goes Across Utah – Across Utah! 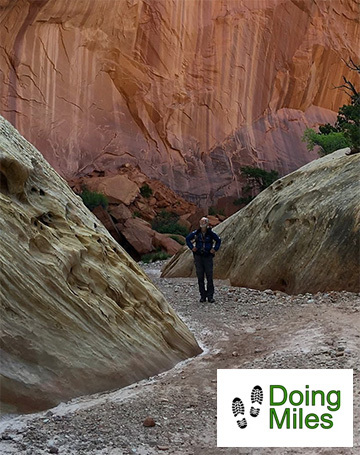 I’m excited to say that James and Amy of DoingMiles.com have successfully completed a trans-Utah hike loosely based upon the suggested route from my site. After a few rounds of emailing back and forth and sharing of maps, they set out in mid-April from the Colorado border and arrived at the Nevada stateline an impressive 35 days later. I frequently state how I hope my site can be used as a “choose-your-own-adventure” guide by those planning long-distance hikes in southern Utah; and that’s exactly what James and Amy did. They hit several of my suggested highlights, but also found their own cool routes for other portions of the hike. I’m grateful for all the intel/data that they’ve passed back to me. This allows me to update the site for future adventurers. While there check out their other great trip reports from the Arizona Trail, the Colorado Trail, extended Sierras hikes, and many more.